The popularity of Blaxploitation films had already begun to wane by 1974, just three brief years after Shaft made a box office splash. The genre needed a kick and producer Fred Weintraub hoped to provide that--literally--with his urban martial arts film Black Belt Jones. Weintraub and director Robert Clouse were responsible for the previous year's international hit Enter the Dragon, which sealed Bruce Lee's superstardom. Their idea to blend Blaxploitation and kung fu must have seemed like a natural fusion. To ensure a smooth transition, they cast American African karate champion Jim Kelly, who appeared in Enter the Dragon, in Black Belt Jones. Kelly plays the title character, a streetwise kung fu master, who comes to the aid of his mentor Pop Byrd (Scatman Crothers). Pop's inner city Black Bird Karate School has attracted the attention of a local Mafioso with inside knowledge of the real estate's future value. When Pop refuses to sell, Don Steffano sends some thugs (led by Pinky...nice name!) over to rough him up. During the fight, Pop has a heart attack and dies. Belt Belt is determined to avenge Pop, save the school, and help out the Feds--with some unexpected help from Pop's black black belt daughter Sydney (Gloria Hendry). Kelly in fight mode as Black Belt Jones. 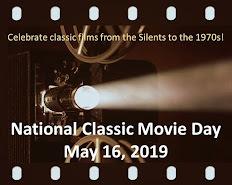 There are numerous excellent action films--Enter the Dragon and Where Eagles Dare spring to mind--that cast credibility aside. If the action scenes are well-staged and frequent enough, the viewer won't have time to dwell on plot flaws. It helps, too, if the performers are charismatic. Unfortunately, Black Belt Jones falls flat in these areas. The title sequence, consisting of freeze frames that interrupt Kelly's swift punches and powerful kicks, is indicative of the film's problems. It robs a potentially exciting fight scene of its speed and rhythm. As the film progresses, the pacing problem worsens and the more time we have to dwell on its plot, the more incredulous Black Belt Jones becomes. A toupeed Scatman Crothers as a kung fu master? 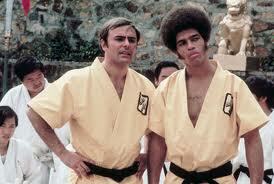 With John Saxon in Enter the Dragon. Kelly was fine as a supporting player in Enter the Dragon (especially considering he was a last minute replacement for Rockne Tarrington). It helped, of course, that the screenwriters gave him many of the film's memorable quips ("Man, you're right out of a comic book!"). Also, if you add up his screen time, Kelly wasn't in much of Enter the Dragon, which was designed as a star vehicle for Lee. In Black Belt Jones, Kelly is expected to carry much of the load. He manages well in the fight scenes (though, even there, his martial arts style is not as fluidly cinematic as Lee's). In his "acting" scenes, he tries to exude cool--though his cool quotient is relatively low compared to charismatic actors such as Richard Roundtree in Shaft. 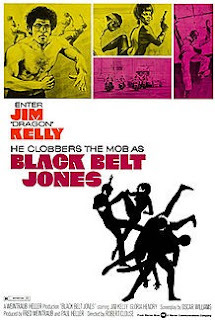 Surprisingly, Black Belt Jones has its admirers, which I attribute to its karate scenes and camp factor. I suppose one could argue that it was always intended as camp, making my criticisms pointless. My belief is Weintraub and Clouse wanted to make a mindless genre film mixing action and humor. Achieving that right amount of balance (as Jackie Chan did in many of his films) can be challenging and that's where Black Belt Jones fails for me. 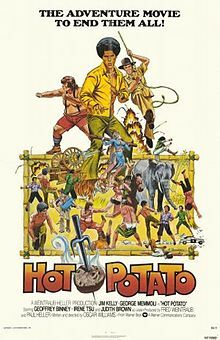 Still, it did well enough at the box office to garner a sequel, 1976's Hot Potato, which sends Black Belt to an Asian country to rescue a senator's daughter. 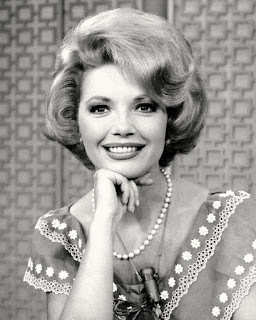 Kelly worked steadily throughout the late 1970s and early 1980s, with lead roles in films like Black Samurai. He also appeared in three films with Jim Brown and Fred Williamson: Three the Hard Way; the unusual Blaxploitation-Spaghetti Western Take a Hard Ride; and One Down, Two to Go (also with Richard Roundtree). Except for occasional film appearances, he retired from acting in 1982. He subsequently became a professional tennis player and appeared on the USTA Senior Men's Circuit. 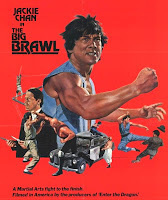 Filmmakers Fred Weintraub and Robert Clouse continued to make occasional martial arts films with splashes of humor. 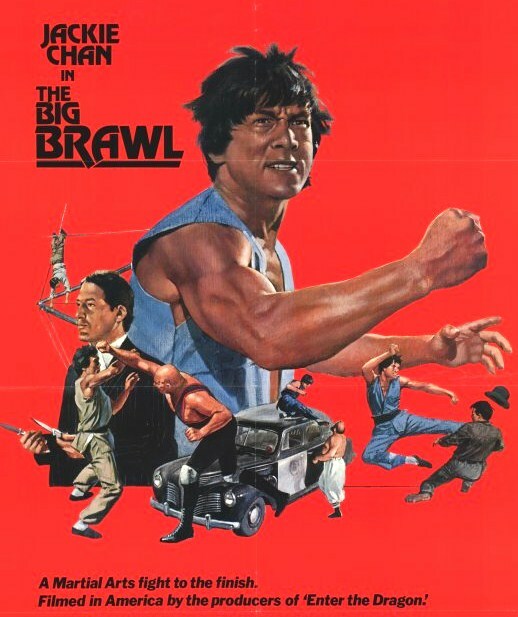 They introduced Jackie Chan to American audiences with The Big Brawl in 1980. Unfortunately, it veered too much from Jackie's natural persona and never found an audience. Jackie Chan wouldn't hit it big in the U.S. until 15 years later when Rumble in the Bronx became a sleeper hit. Rick, this was an informative and fun profile of Jim Kelly and his work, including "Black Belt Jones." I loved the poster at the top of the page which really clued one into Kelly's work on "Enter the Dragon" with its Enter Jim "Dragon" Kelly. Jim did get great lines like "I'll be too busy lookin' good!" in "Enter the Dragon." Great post! 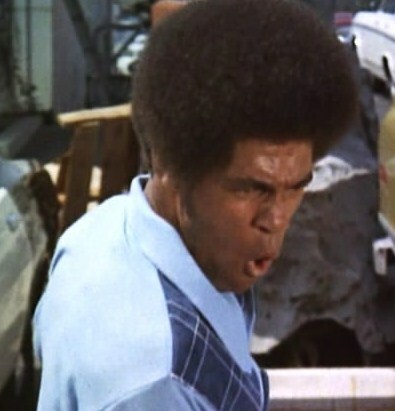 It's funny that you noted how little Jim Kelly was actually in ENTER THE DRAGON. I only noticed that a couple of years ago, watching the movie for maybe the 15th time. Jim's lines are so memorable that it's easy to overlook the fact that he's hardly in it. And I think that's ultimately why a movie like BLACK BELT JONES is less than stellar. Sure, the choreography isn't as good (I mean, ENTER THE DRAGON had Bruce Lee, so that's not a fair comparison), but without ultra-cool, ridiculously quotable dialogue, there's just nothing to savor, and Jim looks lost, like he's simply waiting for the next fight. And though Jim's likeable, I agree that he doesn't have the charisma of other action stars. I've seen BLACK SAMURAI, and it's a little better, but not by much. Still, if he had good lines, he could dish them out with panache, and his enthusiasm was wonderful -- I believe he choreographed some or most of his fight scenes. Great post, Rick, and a superb focus on Jim Kelly. Sark, I agree. I think that Jim Kelly could have had a solid career as an action star for several years given better scripts and stronger supporting players. Look at Chuck Norris and Steven Seagal. They weren't great actors, either, but each had one thing Jim never got--a first-rate star vehicle (e.g., CODE OF SILENCE for Chuck and UNDER SIEGE for Steve) that established their solo careers for years to come.